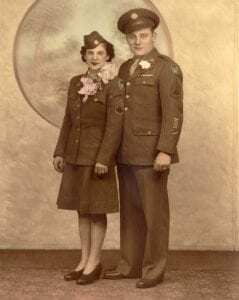 This formal portrait is of Rose Jrolf and Fred Ray on their wedding day in 1945. Rose is wearing a large lily and ribbon corsage and Fred is wearing a carnation boutineer. Rose enlisted in the Women’s Army Auxiliary Corps in 1943 and received training at Daytona Beach, Florida. After training, Rose was first transferred to Nebraska and then quickly promoted to Mess Sergeant at Sedalia Army Air Field, Missouri (present day Whiteman Air Force Base). While at Sedalia, Rose successfully organized a feuding kitchen staff into a working unit. Fred Ray enlisted in the Army in 1939 and was assigned to the Quartermaster Corps and stationed at Albrook Army Airfield in the Panama Canal Zone. Fred was transferred to Sedalia in 1944, where he met Rose. The couple lived in Milwaukee after the war. 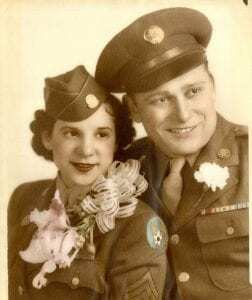 Rose and Fred moved to Milwaukee after being discharged from the military at the close of WWII. Rose became active in veterans organizations and joined the Women’s Army Corps Veterans Association. The couple had one daughter, Virginia. Rose moved to Janesville, Wisconsin after Fred passed away in 1999.